Is your RV Solar Ready? Zamp Solar has partnered with many RV manufacturers like Airstream, Winnebago, Thor, Casita and many more to design solar solutions for RVs. Some RVs are manufactured with full solar systems ready to work for you. Most other RVs are manufactured with just the wires installed and leave the RV easily ready to install solar if the owner chooses to do so – these are what we call Solar Ready RVs. Zamp Solar is pre-wired in over half of all RVs manufactured today. 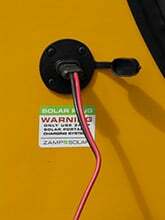 Keep in mind that some RV manufacturers have copied Zamp Solar ports and wiring to claim they are Solar Ready, but do not use Zamp products. Zamp Solar ports are stamped with the Zamp Solar name on them to clearly identify them. Zamp uses the best copper stranded wire in their products. Other brand ports might not be held to the same standards. You have one of two options when it comes to a Solar Ready RV (SRRV) pre-wired with Zamp Solar – a Zamp Solar Sidewall Port or a Zamp Solar Roof Cap. These SRRV options have the hardest part of a solar installation done for you – wiring. Bad wiring accounts for a very large portion of issues in a solar system. We find that 75-80% of issues we hear of are due to bad wiring. Zamp's pre-wired RV minimizes these problems and is the easiest solar system to install. This port is installed and accessible on the outside of the RV wall or battery box and, in most cases, directly wired to a battery. Sidewall ports are ready for any Zamp Solar Portable System. Simply detach the battery clamps from the Zamp Solar portable wiring harness to reveal a plug that connects directly into the sidewall port. Using the sidewall port instead of opening up the battery box or compartment drastically cuts down setup time. Winnebago Sprinter Vans, Sportsmobile and a few others, have a sidewall port that is wired to the internal charge controller. This requires a portable solar system that doesn't have a charge controller like Zamp's Unregulated 140-watt Portable, click here! If you don't have a sidewall port, but you like the idea of a quick and fast setup, you can install one yourself. Check out the Zamp Solar Sidewall Port or the Zamp Solar Bracketed Sidewall Port. There are three separate Zamp Solar roof caps found on many RVs manufactured today – 1-Port, 2-Port and 3-Port. The 3-Port Roof Cap is by far the most used. These caps will be pre-installed on the roof of your RV and a wire will connect the cap down to the charge controller and then on to the battery. If you have a Zamp Solar roof cap, the hard part has been done. All you need to do is select what size and how many Zamp Solar Expansion Kits you want, plus a Zamp Solar Charge Controller. Each expansion kit comes with a solar panel, a wire that plugs into the roof cap and mounting feet to mount the panel to the roof. Select a charge controller that will handle the total amount of solar you plan to install. 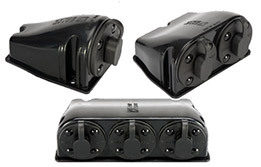 In most cases, we suggest going with Zamp's 30-Amp controller as it can handle up to 510-watts of power. The spot your controller needs to be installed should be marked with a card in the RV. If you don't have this, please contact the RV manufacturer or dealer to find out where to find those solar wires and where to install the charge controller. Contact us if you need help deciding on what size solar system will work best for you or check out our Roof Top Solar Page. For further answers to your questions, contact our solar specialist Jonathan Lewis at [email protected] or 800-866-5353.